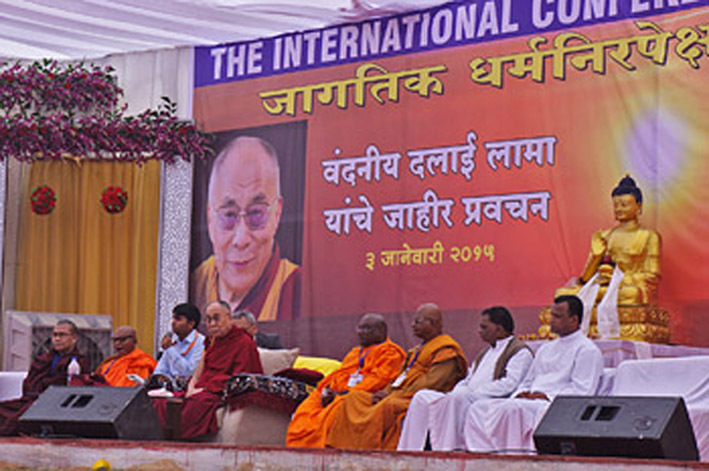 (TibetanReview.net, Jan05, 2015) – Tibet’s exiled spiritual leader, the Dalai Lama, on Jan 3 spoke to a gathering of more than 4,500 people in Nashik city in the Indian state of Maharashtra. He was joined on stage by Burmese, Indian and Sri Lankan Buddhist monks and Christian priests. The event was organized by a group called the Indo-Tibetan Mangal Maitri Sangh. He emphasized the sameness of all human beings and their basic needs despite differences in their look and religious faith. He said religious harmony was important because all the major religious traditions were supposed to bring inner peace, but regretted that too often they were used to foster anger and hatred. He suggested that what was needed was for everyone to pay attention to the inner values that give rise to peace of mind. He added that this was important because our very life depended on the rest of our community; that we, therefore, needed to promote the oneness of humanity. In this connection he emphasized the need to introduce ethical values into the education system and added that work was going on to develop a curriculum that will enable the teaching of secular ethics in a secular education system. He told this to a young woman who expressed concern that many of her generation had lost interest in religion but still needed a common platform on which to base their values. The Dalai Lama said he envisaged that secular ethics would be able to do just that. The Dalai Lama also suggested that differences need not lead to conflict. Looking smilingly at the Buddhist monks belonging to different traditions seated with him, he explained that even within Buddhism there were different views; that there were, however, logical explanations to them, for the Buddha taught his followers in accordance with their different dispositions.